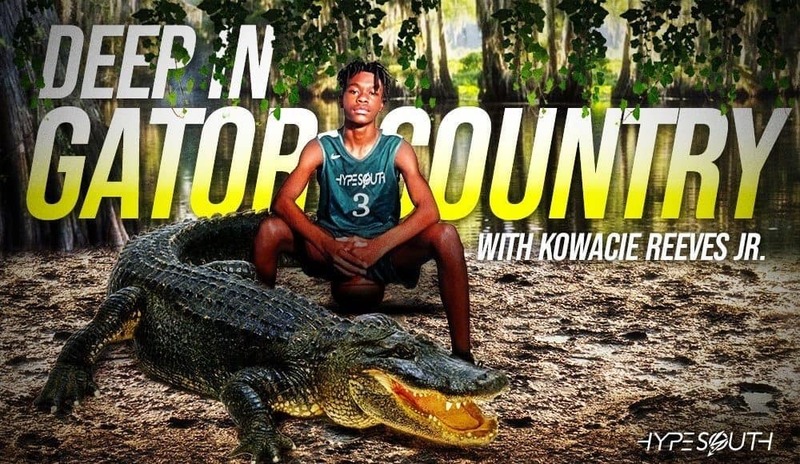 Guards who can read the floor and knock down shots are at a premium in basketball these days and the Gators got in early on one offering the incredibly talented 2021 prospect Kowacie Reeves Jr. A 6’2” flamethrower from deep, he is certain to have multiple high major offers coming after Florida handed him his first-ever offer. I had the chance to speak to one of his coaches at Team TUFF, Cody Henson, about what he had to say about him. Here’s what he had to offer. Reeves Jr. comes from a basketball family with his father Kowacie Reeves Sr. founding Hypesouth Media, a website covering basketball in Georgia, as well as being an involved coach in the area. I had the chance to speak to both of them about Kowacie Jr.’s first offer to Florida, how he manages his studies, and the hoops scene in Georgia. EF: Hey guys! Kowacie Sr., you are uniquely involved with hoops in Georgia. Can you tell everyone a bit about who you are and what you do? KR Sr.: Yes sir, how are you? Well, I’m kind of all over the place here in Georgia. Specifically, Middle-Georgia. First, I am the owner at Hypesouth Media, a news-media outlet specializing in covering prep hoops in the mid-state are. Next, I’m a contributing writer-evaluator at On The Radar Hoops, one of the top grassroots basketball outlets in the southern region. Finally, I’m head assistant girl’s varsity head coach at Central-Macon (GA) High School. I also serve the same role for our 16U Hypesouth independent boy’s travel team. EF: Being so involved with basketball in the area, what has it been like seeing your son get to the age where he’s getting recruited by high major schools and what was it like seeing the offer from the Gators? KR Sr.: For me, it has been very rewarding to see others acknowledge his talent because as his father and the owner of a popular local sports media outlet, he’s sometimes subconsciously omitted. 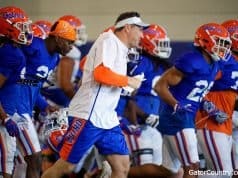 To get that first offer from the Gators was a huge deal and we’re humbled and grateful. EF: You have so much knowledge of the basketball landscape and I’m sure that will be really helpful when it comes to your son’s decision. What advice would you give to a parent of a division-1 basketball prospect who doesn’t have the same knowledge that you do? KR Sr.: I would just encourage them to surround themselves with trustworthy individuals who are knowledgeable about the amateur hoops landscape and recruiting process. Also, take things slow and build positive relationships. EF: All great advice! Specific to your son’s commitment, what is most important to you and him? KR Sr.: As it pertains to Kowacie’s recruitment, building an early relationship with my son and family are a huge deal. It’s really about 90% of the battle for me. KR Jr.: Well, the relationship I have with the coaching staff is always important, but also the direction of the program and academic opportunities. For example, it will be important that the institution offers the major I’m interested in. EF: Really good reasons, that’s for sure. Kowacie Jr., what skills do you think you currently possess that make you stand out in your class? KR Jr.: A lot of people talk about my ability to shoot the ball, but I think just being engaged defensively is something I try to really focus on because it gets me going. I’m not sure if that’s really a skill, but I believe my defense is what will ultimately set me apart. EF: I mean, I would definitely say being engaged defensively is a skill, and one you don’t always see at young ages! (laughs). In terms of being a shooter are you a guy who likes to shoot off the catch or do you like to pull up off the dribble? KR Jr.: I like both, but shooting off the catch is my strength. When I don’t have games I’m in the gym working on a lot of off the bounce stuff with trainer, former UCONN standout Monquencio Hardnett, so it’s an area I’m looking to improve on this summer. EF: Watching the NBA Conference Finals and seeing teams like Houston and Cleveland hunt matchups and isolate, you can definitely see the important of players who can space the floor and also shoot off the dribble. Is there an NBA player you particularly like or one you try to emulate on the court? KR Jr.: Kevin Durant is my favorite player, but I really try to pattern my game after Bradley Beal. He’s a good shooter off the catch and off the dribble. He is also solid defensively when he’s engaged. I sometimes emulate him when I’m in the backyard shooting around (laughs). EF: Kevin Durant is definitely one of the most fun players to watch but unless you’re 7’0” he’d be tough to emulate! (laughs). I can definitely see why you like Brad Beal, your quick release is really similar to his. And a former Gator, I have to add (laughs). As a player that is active on both sides of the floor, what kind of offensive system do you like when your team has the ball and what system do you like to defend with? KR Jr.: Offensively, I like to get out in transition and run to the open spots. My high school (Westside-Macon) coach really stresses the secondary break. He really likes to get up and down the floor and I’ve carried that approach over to the travel circuit. Defensively, my dad always makes us play man-to-man. I really didn’t like that concept when I was coming up through the rec league because I was always getting beat (laughs). But now, I prefer man. I take pride in being able to stop my man from scoring. EF: (laughs) That’s funny about feeling like you were getting beat on defense. I guess that’s the stuff that motivates you to get better. I’d love for you both to answer this…how would you describe that current basketball scene in Georgia and how would you define Georgia basketball? KR Sr.: I might be a little biased here, but I think the prep hoop scene in Georgia is one of the best in the country. Year in and year out we’re producing top talent. For example, if you look at this year’s draft class, Collin Sexton (Pebblebrook) and Wendell Carter (Pace Academy) are projected lottery picks. Also, you could take a look at current Boston Celtics guard Jaylen Brown (Wheeler) to kind of gauge the talent we produce here in the Peach State. As you can tell, I get a little excited about these kinds of topics, so I’ll just pass it along to my son (laughs). KR Jr.: I think we have some really good players here in Georgia every year. My teammate Khavon Moore is headed to Texas Tech and I think he’ll go to the NBA one day. I also had a chance to play against Ashton Hagans this year. He’s going to Kentucky and I think he’ll be in the NBA one day too. I would define Georgia basketball as hardnosed, fundamental, and straight to the point. EF: (laughs) I knew you would be excited about it and that’s why I had to ask. 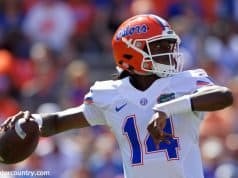 I know the Gators have been ramping up their recruitment in Georgia so I know you’ll be the guy to talk to about the talent. Kowacie Jr., you’re a guard and guards are seen as arguably the most important players in the modern game. What do you think are important traits of guards nowadays and what do you think a common mistake is that guards often make? KR Jr.: An important trait for guards is to have basketball IQ. We must pick our spots offensively and play within the flow of the game. Mistakes guards make a lot is playing too fast all the time, I’m guilty of it sometimes because I like to get out and run. My dad is trying to teach me when to play fast and when to slow down. So, I think just playing too fast all the time is a common mistake modern guards often make. EF: That’s a great answer, it’s always tough to play fast but also play under control. Speaking of IQ, I’ve heard you’re a 4.0 student. How do you manage the balance of excellence in both the classroom and on the court? KR Jr.: Well, time management is key. I try to knock out my homework during study hall during the season so that the workload won’t pile up on me. Also, my mom and dad are recent college graduates so that really motivates me. I want to make them proud, I want to be known as a student-athlete and not just a basketball player. EF: It’s great you’ve got that figured out at your age, that shows a lot of maturity. I’ve taken so much of your time so I’ll just ask you one more question each. First, Kowacie Jr., what’s one thing not related to basketball you’ll be doing this summer to relax? KR Jr.: I appreciate your time Mr. Eric, thanks! I’ll play a couple more travel tournaments to finish up the month of may and then school ball workouts and team camps begin in June, so I won’t really have much time to relax until the beginning of July. My family always takes a vacation around that time. We’ll more than likely go to the beach in Florida somewhere. EF: Thank you for your time! And I hope you have a great time when you finally get the chance to relax on a beach! (laughs). Thanks so much. Kowacie Sr., I lied, I’m actually going to ask you two questions. 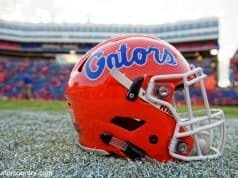 Obviously I’m interviewing you for Gator Country but I’d love to get your take on some SEC news. What’s the thought around the state regarding Tom Crean being hired at the University of Georgia? KR Sr.: (laughs) No problem. People in Georgia are excited about the hiring of Tom Crean. The ones I’ve talked with are really impressed with him adding guys with strong Georgia ties like Chad Dollar and Amir Abdur-Rahim to his staff. I personally think he’ll change the culture there and turn UGA into a serious contender in the SEC. I also have a really great relationship with his first signee, Tye Fagan, so I’ll be watching closely. That kid is a flat out winner. EF: Good to know, I’ll be sure to watch for him. Lastly, as someone who coaches both men’s and women’s basketball, what’s the biggest difference between coaching guys and girls? KR Sr.: Wow, where do I start? I think boys are more individually oriented on the court because they are so much more athletic. Also, in my experience boys reject discipline more than girls (laughs). I don’t know why! On the flip side, girls are more team oriented because they are naturally less athletic than boys, so they tend to rely on each other more to get the job done. The girls I’ve coached really embrace discipline and love to ask questions. I still can’t figure out the difference in that dynamic between the two. I really appreciate your time, Eric. If you ever need, don’t hesitate to give me a buzz. EF: Haha, that’s great stuff, thank you! I’m sure I’ll be hitting you up more about your son and other players from Georgia. Thank you for your time gentlemen! Take care! KR Sr.: Our pleasure! You take care and be safe as well. Again, thanks! You can follow Kowacie Reeves Jr. at @wacie_wacie. You can follow his Kowacie Reeves Sr. at @HypesouthMedia and check out his website at www.hypesouth.com. Also, thank you to Kowacie Reeves Sr. and Hypesouth for providing the graphic for the article and thanks to Cody Henson (@Coach_Henson33) for the quote.